DAVID Beckham is on the verge of signing for Paris Saint-Germain, according to reports on both sides of the Channel saying he could pick up a pay packet of around €13 million. The club wants to use his fame and experience of playing for Manchester United, Real Madrid and AC Milan as a springboard for its own ambitions. The signing of the 36 year old midfielder would lure other big-name, big-money stars to the club recently bought by Qatari Nasser al-Khelaifi and transform it into a global brand. PSG sporting director Leonardo confirmed on RMC radio he had spoken to Beckham, saying; "We've spoken. I know him. His contract [with Los Angeles Galaxy] has finished: now he is going to decide his life. If he is thinking of coming here we should be happy - but it depends on lots of things." He added: "When you talk about Beckham, you're talking about something big. I think he can still bring something on the pitch with the person he is and the experience he has." However, in the past 48 hours Beckham has denied any contact with PSG and has been linked, instead with London club Tottenham. PSG owner al-Khelaifi himself said Beckham's decision was between them and Spurs. The news comes ahead of this weekend's "clasico" match between Olympique Marseille and PSG - with extra spice added by both the Beckham claims and the news PSG has nipped ahead of OM in the club wage stakes. An inquiry into France's most popular clubs by Le Parisien found the massive influx of Qatari funds means the Paris wage bill is higher than in Marseille. Although the highest-earner is OM's Lucho Gonzalez who pockets €360,000 brut a month, over at PSG fellow-Argentinian Javier Pastore trousers €350,000 and Leonardo is paid more than his players... at €400,000. In all, PSG counts 11 players who are earning more than €200,000 a month, against nine in Marseille. The poorest paid player in the two squads is Marseille's Billel Omrani who gets €8,000. OM coach Didier Deschamps is on €250,000 while PSG's Antoine Kombouaré is on €140,000. 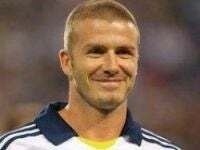 With this in mind, former Marseille owner Bernard Tapie put the possible arrival of David Beckham into perspective, saying: "Outside of France, who has heard of PSG? Next season, if Paris play in the Champions League with Beckham in the team the whole world will speak of PSG. Not just because it will have become champion of France but because it has a global star in the side. When you have David Beckham in your team the world of football, even referees, does not look at you the same."